H�vard Danselsen (left), Tine Nordgreen (INTROMAT) and Erik Fosse. Oslo University Hospital heads projects DoMore! 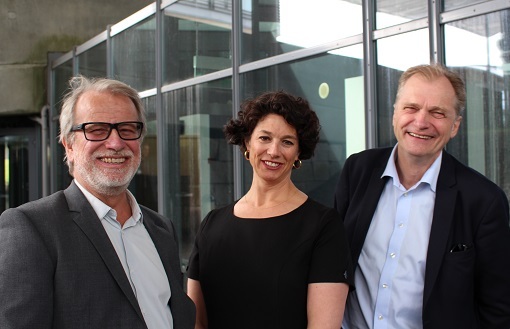 led by Håvard Danielsen from the Institute for Cancer Genetics and Informatics and BIGMED led by Erik Fosse from the Intervention Centre project receive Lighthouse project grant from the Norwegian Research Council's IKTPLUSS area of commitment. The funding for each project is 60 million NOK over a five-year period. There were 76 research teams competing for the prestigious grant and only three winners- The third project is INTROMAT, led by Tine Nordgreen from UiB. The ​DoMore!​ ​team ​is composed ​of experts within several fields, including digital imaging, processing, robotics, pathology, cell biology, surgery and oncology, both in Norway and abroad​​. The vision behind the BIG data MEDical solution (BIGMED) is to lay the foundation for an ICT platform that addresses the analytic bottlenecks for the implementation of precision medicine, and paves the way for novel big data analytics.